As England's greatest composer of the Baroque, Henry Purcell was dubbed the "Orpheus Britannicus" for his ability to combine pungent English counterpoint with expressive, flexible, and dramatic word settings. While he did write instrumental music, including the important viol fantasias, the vast majority of his output was in the vocal/choral realm. His only opera, Dido and Aeneas, divulged his sheer mastery in the handling of the work's vast expressive canvas, which included lively dance numbers, passionate arias and rollicking choruses. Purcell also wrote much incidental music for stage productions, including that for Dryden's King Arthur. His church music includes many anthems, devotional songs, and other sacred works, but few items for Anglican services. There were popular myths surrounding the life of Roman Emporer Diocletian (AD 284-305), and this opera is about two of those. The first concerns the prophecy leading up to Diocletian becoming Emperor. The second myth surrounded his abdication. The story of Diocletian was first turned into a play by Beaumont and Fletcher in 1622. It was revived several times until Thomas Betterton, impresario of the United Company, got hold of it and decided to turn it into a semi-opera in 1690. He altered the play and added operatic elements: elaborate machinery, costumes, effects, and staging. M. Priest supplied the dances, and H. Purcell the music. Dioclesian was a major turning point in Henry Purcell's musical career. As a semi-opera, it was very well received by the British public. It was the first semi-opera to be published in full score, in 1691. Today it provides a good resource for his theater and his music. 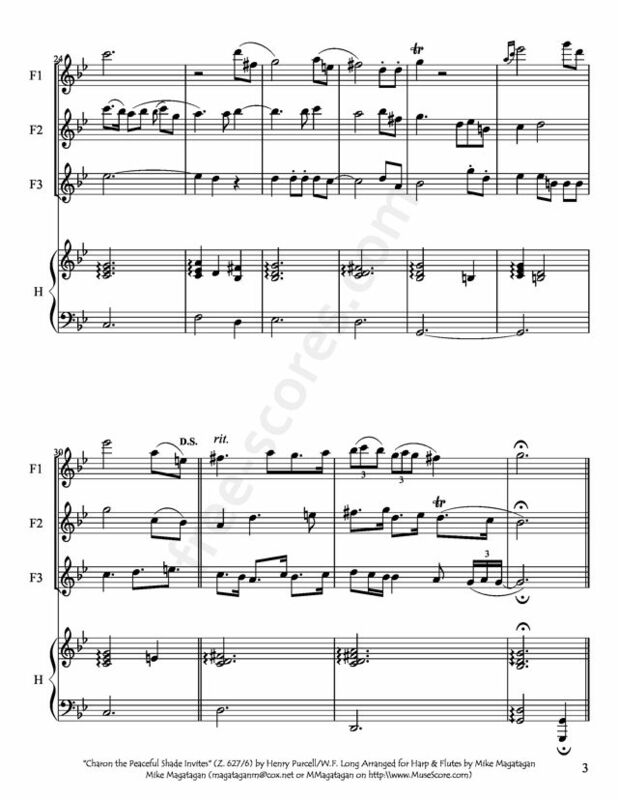 He included in the score an oboe quartet, which is at times used to double the violins and at times stands alone. 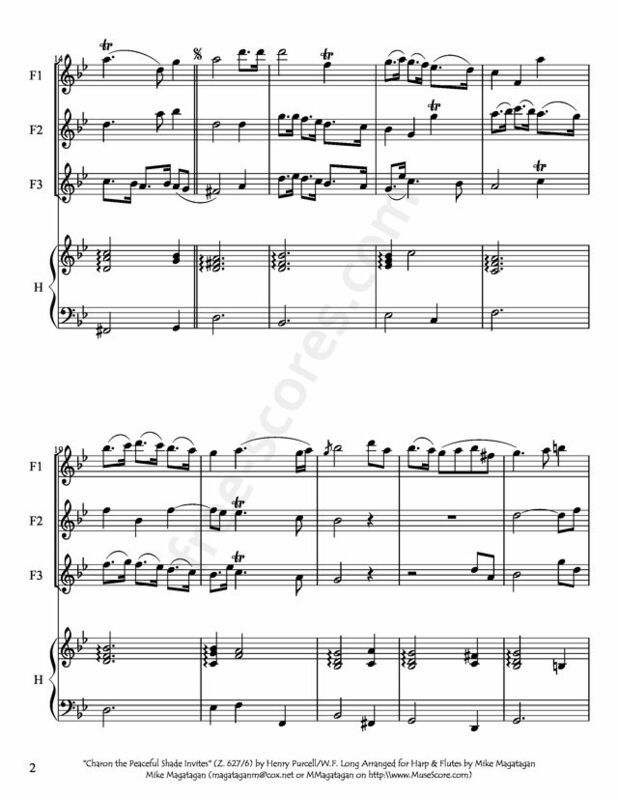 It includes a tenor oboe, a very rare instrument, and a bass line written for the bass violin. The opera has two main musical episodes. The first act is an extended triumphal scene full of original and clever dances, instrumental pieces, choruses, solos, and duets. They vary in texture and form and are loosely connected. Purcell opens with a prelude and a bass solo. "Great Diocles the boar has killed" introduces the celebration. Then Purcell's large scale organization carries the listener through a victory celebration, a coronation scene, and a betrothal. In many of these pieces Purcell uses one rhythmic figure throughout. The variety is supplied through thematic variation, canonic entrances, and imitation. "Since the toils and hazards" features a tenor solo and chorus, followed by a symphony for two flutes and continuo. It's full of suspensions, imitative figures, and an extensive four-bar melisma on the word joy. The second major musical episode is in Act Five, which consists of the "Masque of the Triumph of Love." It is often removed and performed alone. As a symphony is playing, three elaborate machines set the stage for the palatial scene. Many of the songs are about the pains and pleasures of love, pastoral contentment, and the delights of wine. There is a prelude for violins and oboes and Cupid begins the masque with "Call the Nymphs," a solo for Cupid and chorus. Purcell's writing in this masque is filled with invention and vitality. The variety of solos, choruses, duets, and dances is exciting, and the action doesn't cease from the beginning of the masque until its culmination in the choral number "Triumph victorious love." Full of trumpets and oboes again, it is a grand and spacious chaconne, in which the entire chorus breaks into dance. "Charon the peaceful shade invites" (Second song, by a woman) is from Part 12 No. 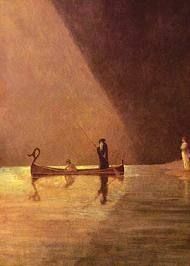 6b (Page 21) recanting a tale from Greek mythology "Charon", the ferryman of Hades who carries souls of the newly deceased across the rivers Styx and Acheron that divided the world of the living from the world of the dead. 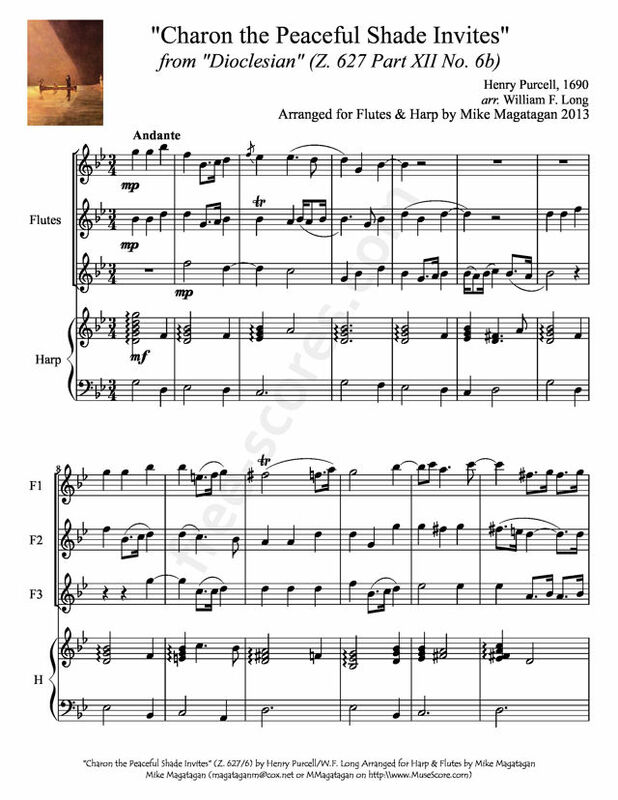 Although originally written for Voice (SAT) and Continuo, I created this arrangement for Flute Trio and Concert (Pedal) Harp.